The Terex T780 tackles the most challenging heavy lifting tasks with its 80-ton maximum lifting capacity. This telescopic truck crane has a main boom with a maximum length of 126 feet and a maximum jib length of 57 feet, making it extremely versatile on various job sites. An after-cooled and turbocharged Detroit Diesel 60 series engine powers out up to 435 horsepower for a strong performance that never wavers or weakens. A 100-gallon fuel tank ensures that the Terex T780 doesn't fizzle out in just a short time. While the Terex T780 comes standard with 10-speed manual transmission from Eaton Fuller, it can also be configured with an Alison transmission system. The Terex T780 comes with a state-of-the-art operator's cab designed to give drivers quick and easy access to the controls while keeping them comfortable. This spacious cab starts with the deluxe operator's seat, sliding access door and tinted window. The hydraulically-driven heater keeps operators warm on the most frigid job sites while the electro-proportional joysticks allow the operator to precisely move items to exactly where they need to go. A computerized load indicator includes a graphic interface that makes lifting and moving objects safe and secure. 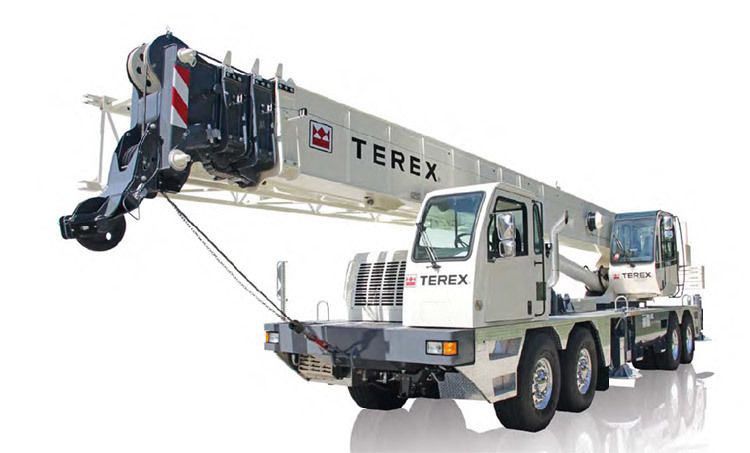 In addition to the standard features found on the Terex T780, there are several accessories that can be added in order to increase this truck crane's capabilities. A work light installed on the main boom aids projects that must be undertaken at night while cab lights provide the same for the operator. There is also the option to have a normally-controlled brake installed on the Terex T780. A lattice-type jib and a rope roller device are other accessories that might prove valuable. Since 1973, Scott Macon Equipment has been providing the southern United States with the telescopic truck cranes and other heavy equipment they need to complete projects. As an authorized Terex dealer, Scott Macon is the place to turn when you need a versatile and road-worthy hydraulic truck crane like the Terex T780. Contact us today to see our selection.